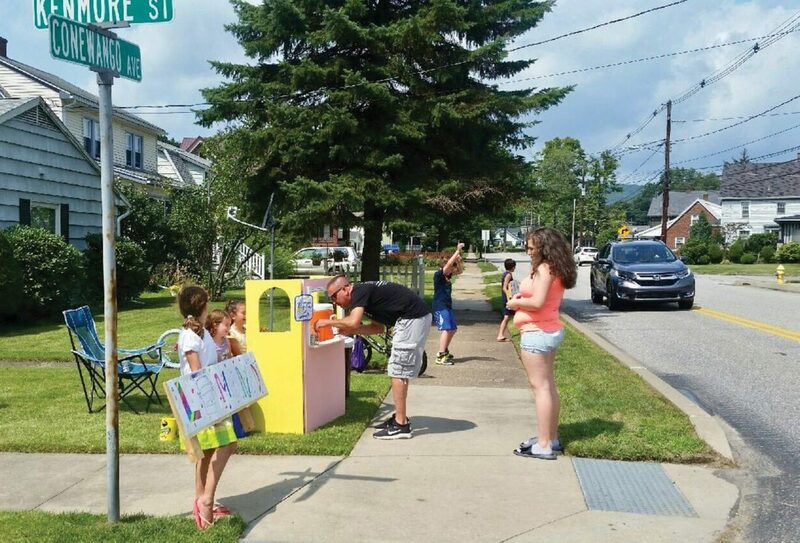 WARREN, Pa. — When life gives you hot weather, sell lemonade for charity. A group of young Warren entrepreneurs — all in fourth and fifth grade at St. Joseph Catholic School — will donate almost $70 to the Salvation Army. On Aug. 26, five friends — Sebastian Oyola, Bella Oyola, Gavin Heeter, Emma Kisselbach, and Adriana Royo — ran a lemonade stand for two hours. Royo and Bella Oyola came up with the idea. It was the end of summer. They were outside. They didn’t want to be. “It was super hot, so we didn’t want to play outside,” Royo said. It would have been a perfect day to have a lemonade stand. They had the inspiration, but they didn’t have the products they needed. So, they made some arrangements. They turned an old puppet show stage into their lemonade stand; they invited additional workers; they made sure they had lemonade. And, they got together and agreed to donate to the Salvation Army. The day they chose turned out to be perfect. “It was super hot,” Sebastian Oyola said. “In the 90s,” Heeter said. Those two had been recruited as dancers. “At first, Gavin and I were picking up signs and shaking them,” Sebastian said. “A few minutes after I came for the stand, Adriana’s father brought a speaker and we were dancing to music,” Kisselbach said. They showed off their dance moves and even some gymnastics. The business partners took turns running the stand and doing the marketing. Business was brisk. They sold their product for 25 cents per cup. “Some people were stopping their cars and coming back for lemonade,” Bella Oyola said. The dancers made sure they included information about proceeds going to charity in their sales pitches. That brought in even more people. And, it brought in even more money. Some people were paying more than the 25-cent rate for their drinks. One customer paid $10 for four cups of lemonade, Bella Oyola said. At the close of business, the partners retreated inside. They had collected $73.19 and they will donate $68.19 to the Salvation Army. “We needed to get paid for our hard work,” Bella Oyola said. “Each of us got a dollar,” Royo said. “I lost my dollar in the washing machine,” Heeter said. The dollar is not what the youngsters will take from the experience. Even if they can’t see the faces of the people that benefit from their effort, “we’ll know,” Royo said.